By offering our customers three different types of checking accounts, and pairing them with products that match your lifestyle, First National enables customers to bank with us from around the world. Through safe, convenient and user friendly products, First National is proud to offer our customers technology when they want it; customer service when they need it. No matter if you’ve been saving for years, or just beginning to save for the years ahead; our savings accounts or CDs will be sure to fit your budget. Looking to for customized service for your business banking needs? We would be happy to assist you there as well – explore our many business banking options by clicking below. Account takeovers happen when the wrong people dig up enough of the right private information about you to gain access to your checking or savings accounts. 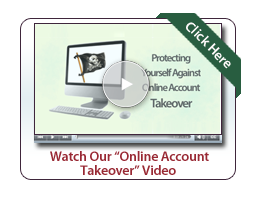 Check out the video below for some things you can do to protect personal information and help battle takeover attempts. We keep your information secure, do you? Mobile apps, account alerts and more for on-the-go convenience. Find out how to increase your rate on a CD! Mon-Fri 8:30 a.m. to 4:00 p.m.
MON-FRI 7:30 a.m. to 6:00 p.m.